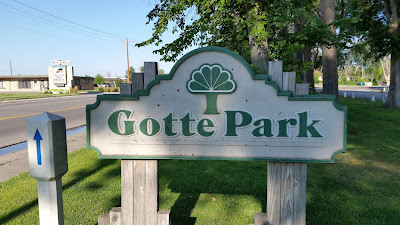 I made one more camp stop prior to reaching Colorado and spent a weekend camping in Kimball, Nebraska's Gotte Park. 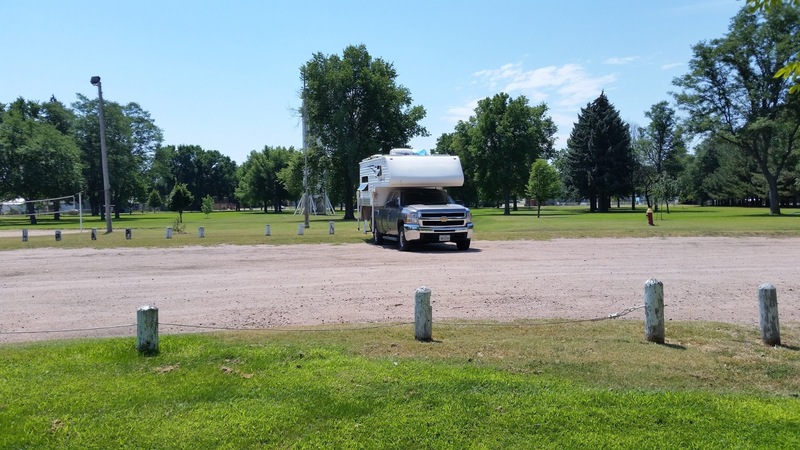 The park is huge for such a small town and houses the municipal swimming pool, picnic shelters, clean bathrooms with flush toilets, several fresh water outlets, tennis courts, basketball courts, sand volley ball courts and children's play equipment. The park is on NE 30 which becomes 3rd Street within Kimball's city limits. 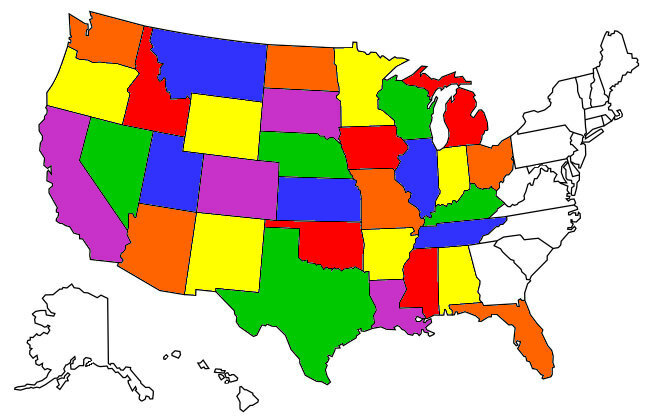 Kimball allows up to three nights of camping in two areas of the park. The most obvious is a road just inside the park that parallels Highway 30 where there are four or five water hookups (there are no electrical hookups). I noticed street noise was pretty heavy along these spots so I went to the center of the park near the volley ball courts where it was perfectly quiet. I was the only camper the weekend I stayed there. Before finalizing my choice of camping spots I asked a local 10 year old if it was OK to park where I was and he assured me "lots of RV's camp there all the time" so that was good enough for me. While it was completely sunny the weekend I spent at Gotte Park so the Tank's solar setup supplied all the electricity I needed, it was also pretty hot inside. 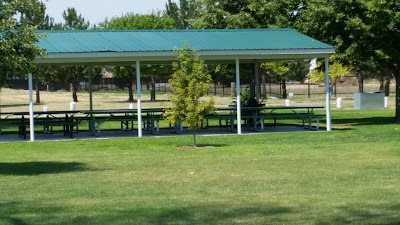 I noticed that the picnic shelters had electrical outlets which, almost always, are disabled or outright broken at the other parks I've visited but these worked so I enjoyed plugging my laptop into them and spending mornings doing my normal surfing outdoors in the shade. 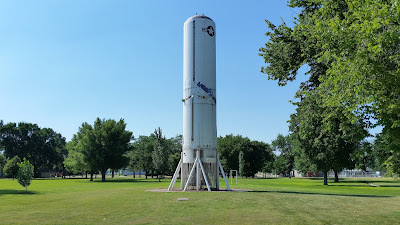 That's a Titan 1 nuclear missile! 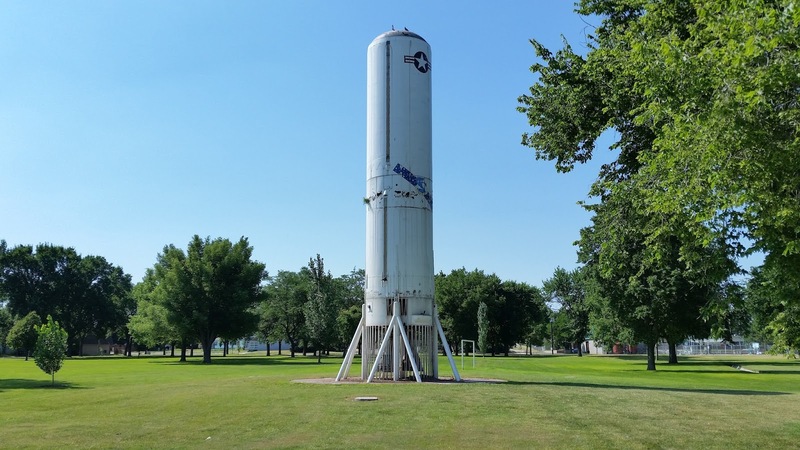 I guess the missile is to commemorate the many Missile Command silos that once dotted Nebraska. For folks traveling east or west along I-80 Gotte Park makes a convenient overnight or even weekend camping experience. 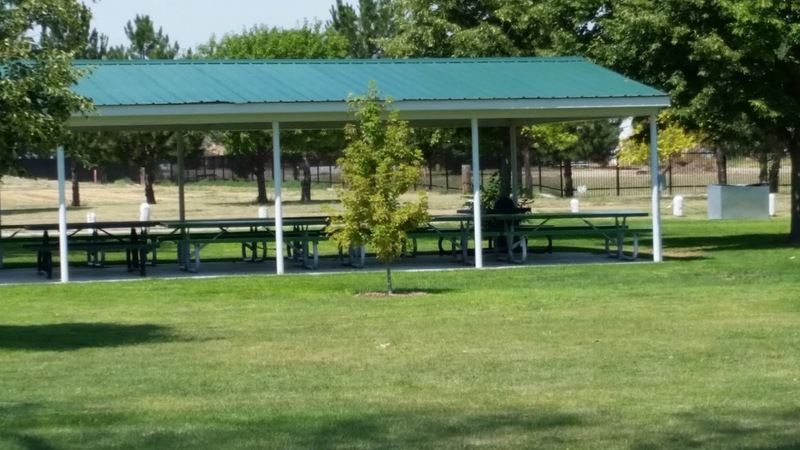 Kimball is just a few miles north of I-80 and the park is just across the street from a full service grocery store with decent prices if you're in need of resupplying. I enjoyed my stay there and would stop there again.